Author's Note: Hey, it's Jenna. 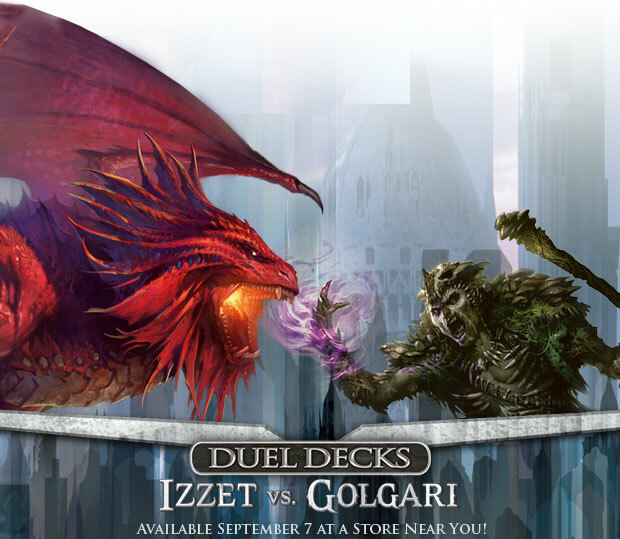 We'll be doing another Planeswalker's Guide next week. Today, we wanted to share flavor from the new Ravnica. 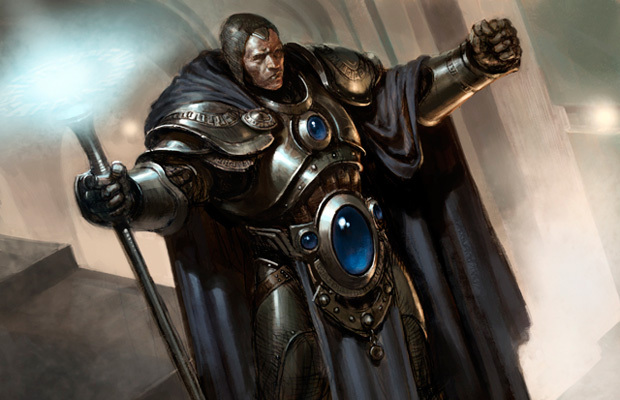 A Boros officer investigates a series of murders that are linked with a Golgari riot that happened years before. The story culminates with a preview card in part 2. Thanks for reading! Witches and thieves," Branko thought as he studied the line of Golgari prisoners. He gripped the handle of his stun-baton. He wanted to scream, batter down the walls of the Azorius Detention Compound, and flee into the sunlight. He wanted to be away from them and their strange mutterings and savage glances. "Keep your baton out," he whispered as he passed Gebris, a novice guard who was still in his teens. Gebris thought too highly of himself and was mean-spirited even on his good days. "I'll do my job, you do yours," Gebris mumbled, which was made no sense because they had the same job. Branko wanted to smack some sense into him. 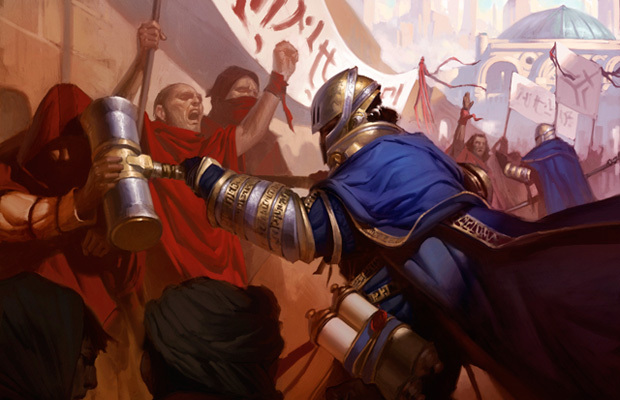 The Azorius Arresters had raided Golgari territory earlier that night. But once inside the Detention Compound, some of the Golgari overwhelmed their captors and gained control of the first floor. Maybe more floors were lost by now. Branko wouldn't know. He'd been stuck down here in the basement. "Witches and thieves," Branko murmured again as he paced along the corridor, just inches from men eager for the chance to gut him. They'd been shut in the stifling corridor for hours. So far, the prisoners had been contained, but they were getting restless. Kneeling with your hands tied behind your back would be hard for anyone. As the hours passed, Branko pitied them. But the rest of the guards, like Gebris, were more agitated than sympathetic. Most of the prisoners were grubby humans with fragile-looking skin that probably had never seen the sun. A few of the larger humans were shackled with wooden harnesses and glow-cuffs. Scariest of all, there was an emaciated gorgon who had been bound, gagged, and blindfolded. Her hair was loose, and those writhing tendrils made Branko's skin crawl. Even her compatriots shied away from her. She knelt alone near the barricaded door, looking oddly regal despite the grim circumstances. Watching her, Branko realized he had to face the truth. They were too few guards in charge of too many prisoners. "Rot crawler," Gebris shouted suddenly. He loomed above a sickly looking man with sunken cheeks and the faded clan tattoos of an ex-Gruul. The man said nothing, just stared back with hatred in his red-rimmed eyes. "Now, that's a rat face," Gebris taunted. "Maybe they flushed you at birth? 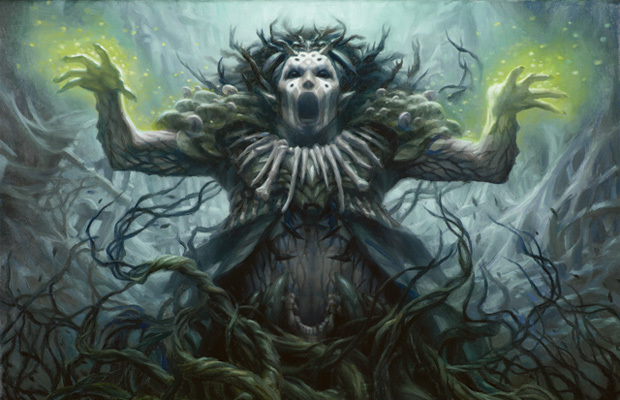 Down into the arms of Mama Golgari?" Branko wished there was a superior officer with them. 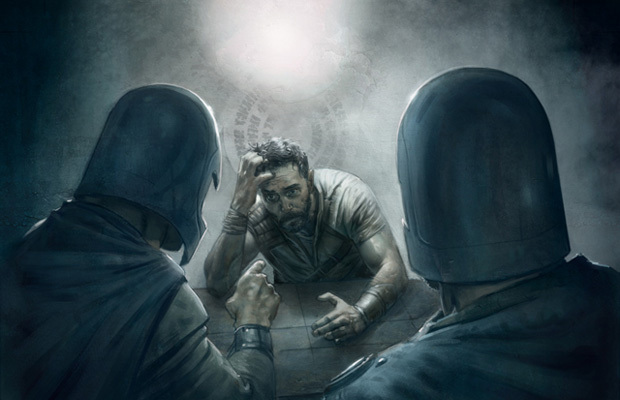 But during the initial chaos after the Golgari revolted, their superiors had shunted the remainder of the prisoners to the basement. They ordered the guards not to move until relieved and sealed the exit with barricade-wards. No one in. No one out. Not until their betters said so. "You love filth so much, how about this?" Gebris took the toe of his boot and shoved it against the man's face, cracking his head against the wall and holding it there. All along the corridor, the Golgari began hissing. It rose into an animalistic growl that reverberated off the tiled ceiling. "You'll be cited," Branko warned Gebris. "So?" Gebris scoffed. But he dropped his leg. The man's lip was bleeding, and he didn't look up again. The hissing stopped, but the prisoners' lingering anger felt almost tangible, as acrid as if smoke hung in the air. "Calm down," Branko whispered to Gebris. Branko laid a hand on the shorter man's shoulder, but Gebris shrugged it off angrily. Since they met a few months ago, Gebris took an immediate dislike for Branko, who stood more than seven feet tall. Besides being tall, Branko was as broad and muscular as a blacksmith. He sensed that it was his size alone keeping the situation in check. "I didn't ask for this!" Gebris stormed. "The bastards planned this." "Who, Zivan?" Branko asked. 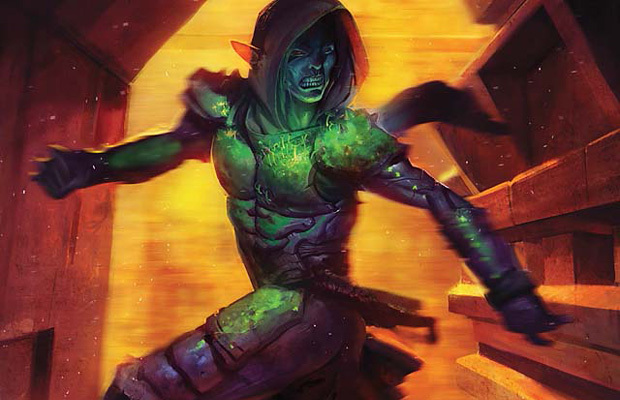 Arbiter Zivan had ordered the Mass Arrest, which had been touted as the ultimate clean-up of the Golgari. "No, you idiot," Gebris shot back. "Them, the rot crawlers. They let us arrest them, so they could come back and kill us here." Branko didn't reply. He didn't like talking in front of the prisoners. He could feel their eyes on his back, tracking his every move. "Let's take them through the exercise yard," Gebris urged. "We can lock them in the pens in the South Block." Branko saw the logic in this. There was no exit through the South Block, but at least the prisoners would be contained by something sturdy. "What about the sunlight?" Branko asked. There were strict protocols about the transportation of Golgari prisoners and exposure to sunlight was forbidden unless the proper forms had been approved. "I don't care about sunlight," Gebris shrieked. Branko quickly nodded his agreement—Gebris was in a dangerous state of mind. After they'd roused the prisoners, Branko waited with the main group inside the door at the end of corridor. He sent two at a time across the sunny yard. Gebris met them on the far side. They'd only moved half the group when the man with the bloody lip reached the front of the line. Branko motioned him out in the sunlight, but he refused to budge. As Branko reached for him, there was a ripple of motion among the remaining Golgari, who stood up en masse and surrounded him. Branko could see over the crowd, and two prisoners were leading the gorgon toward him. One of the prisoners had freed himself from his bonds and was reaching for the gorgon's blindfold. They were going to use her as a weapon. Boxed in by bodies, Branko couldn't make it to the door. They kicked at him, trying to break his knees. Righteous indignation swept over him, and he attacked back, slamming their spindly bird bones into walls, shattering skulls with punches, snapping spines over his massive knee. The gorgon—now unleashed from her bonds—was about to enter the fray. Branko didn't like fighting in these close quarters. Unless he wanted to become a granite block, he had to take her down first. Closing his eyes, he charged at the gorgon. He latched his massive hands onto her bony shoulders and lunged for the open door, dragging her with him. The sun was burning hot as they tumbled into the sandy yard. Branko landed partially on top of the gorgon, but managed to keep his eyes closed. She hissed unfamiliar words and clawed his face. Swinging blindly, he smashed his elbow against her again and again. Her body grew still beneath him. But as he started to stand up, fingers tore at his ear. He heard a ripping noise and screamed in agony. Branko rolled away from the gorgon, his eyes inadvertently opening on the chaos around him. Prisoners were running freely through the yard. They'd lost control. His eyes flicked toward the gorgon, who was crouched on the ground. Pain was making Branko nauseous, and his ear seemed to be dangling down by his neck. The world tipped sideways as crimson light pulsed around him. Branko knew he was about to pass out. Beside him, blood gushed from the side of the gorgon's head. Her head lolled to the side and flickering light engulfed her. Branko's hands dug into the dirt as if to keep the balance he'd already lost. When he looked up again, the imprint of her body in the sand was all that remained. The gorgon was gone. It was a straightforward case: The eighteenth floor of a tenement collapsed, killing four people, including two members of the Lapt family. Mr. Lapt was asking for compensation. The wooden floorboards had been soft for several weeks. I beleive[sic] there was a leaky pipe. I spoke to the landlord about it twice, and he did nothing. Believe? The more Relov looked at that word, the more annoyed he became. The first ten pages of the Application were in order. The Submitter had cited the correct statutes and his pathwork of legal justification was sound. There were no Invisibles to worry about—the landlord was a guildless slumlord with no underworld connections that could spell trouble for the Azorius at a later date. Relov considered the teetering stack of documents on the corner of his desk. Well, he would teach this man a lesson. Learn to spell, Mr. Lapt, and stop wasting my precious time. With that, he slid the Application to the bottom of the stack. Relov turned his attention to the other piles of paperwork on his desk. He enjoyed the meticulousness of legal language—assuming it was well done—and the afternoon passed pleasantly. Relov approved a fine on those arrested in proximity to a riot, even if it couldn't be proved they participated. Next, he gave his approval for a new statue of Grand Arbiter Leonos. It had taken months of argument to agree that it would be placed near (but not next to) the main entrance of New Prahv. "There's a rattling noise in the ventwork that's distracting me," he said to the young woman. "Can you see to it?" "I can submit a request for a Steward," she replied slowly. It wasn't a clerk's job to fill out the Request Form, but they were tedious, and a clerk was bound to have more spare time than an Arbiter. "I appreciate your kindness," he said with a winning smile. "Yes, sir," she said. She laid two sealed letters on his desk. "These arrived by courier." His smiled soured. He could reprimand her for not presenting them immediately, but decided to let it pass. He needed that Steward after all. He signed the Document of Receipt and she disappeared into the maze-like corridors of the Azorius guildhall. 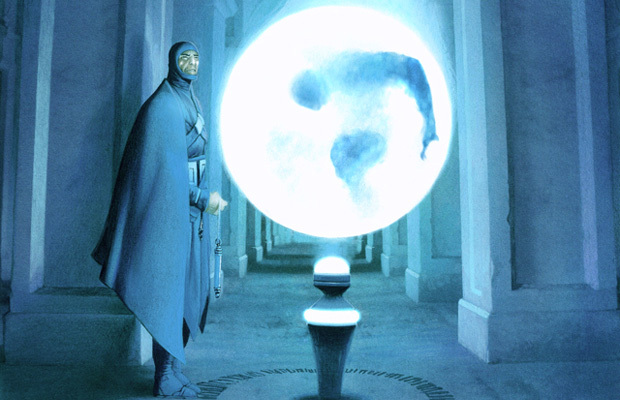 The first letter was an urgent Application for Immediate Use by an Orzhov enforcer, who wanted access to detention spheres. The request violated twelve statutes, but when Relov saw the pale pink number printed at the bottom, he signed without hesitation. He ran his thumb over the number, smearing the amount that would soon be deposited in his account at Vizkopa Bank. The second letter was from Javy, a Boros investigator and one of his oldest friends. Years ago, he'd spearheaded a joint venture with the Boros known as the Failsafe Initiative. 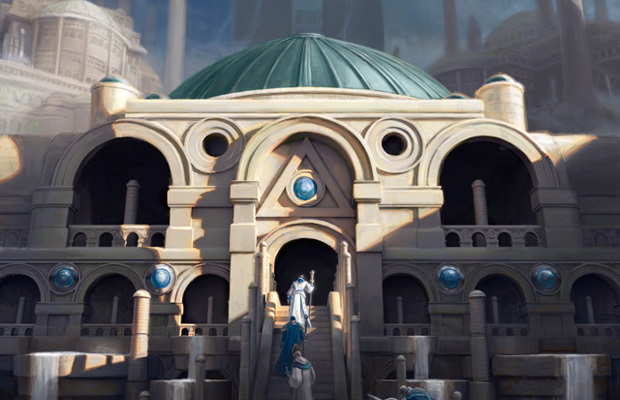 Now defunct, it rescued children from the Gruul or out of the pauper prisons and placed them in either the Azorius or Boros academies. Javy had been his most ardent supporter. In those days, they were young, idealistic, and more than a little foolish about the possibility of changing things for the better. What is the culmination of a life of words? Buckets of blood. Come now.